Snow dyeing is a technique used to dye fabric using snow and since we have a lot of snow I thought I would give it a try. Actually Lori kept emailing me all week to say she was going to try and that I should too! She knows I need a kick in the pants to try new things and since I didn't want her to have all the fun I gave it a go :) This is a very cool dyeing technique and I love the results. The basic science to this is the cold temperture provided by the snow cause the dye molecules to slow down their ability to attach to the fabric giving the dye time to separate into their original colors if your using a mixed dye, not a pure dye. Some colors will move a bit faster and attach to the fabric first creating the really cool patterns on the fabric. 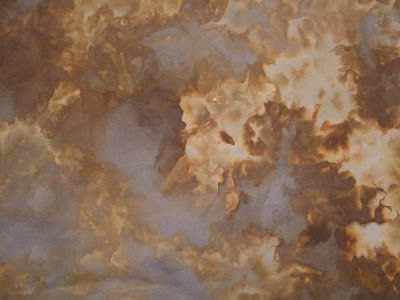 This is shown really well on the fabric dyed with the color Chino. It almost looks like burnt paper the way the colors separated. 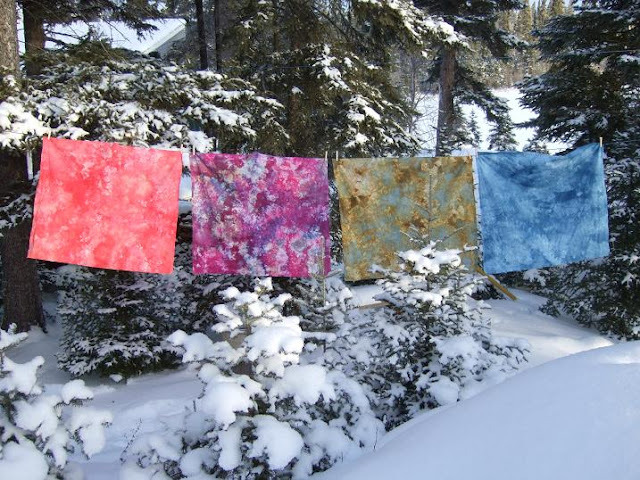 This post is just about the snow dyeing process and if you would like to learn more about fabric dyeing using the low immersion technique as well as what dyes and supplies I use see my tutorial post here. 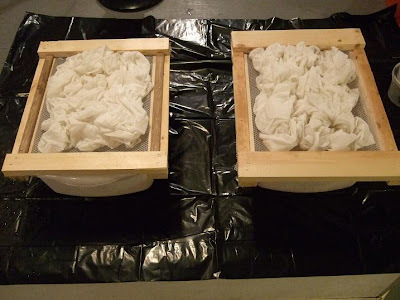 To start I got my husband to build me two mesh screens to hold the fabric above the buckets that will catch all the melting snow. My fabric was presoaked in Sodium Carbonate ( Soda Ash) for a few hours. I use Mx Procion dyes and mixed 1/2 tsp yellow, 1/2 tsp salt with 1/2 cup water, and the same for the Fuchsia and Cerulean Blue. 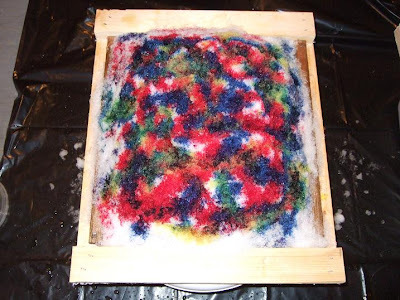 I then pour the three dye mixtures on top of the snow on the first fabric. I poured Navy and Royal Blue on the second. Here is Chino on one and a Scalet/Red mix on the other. 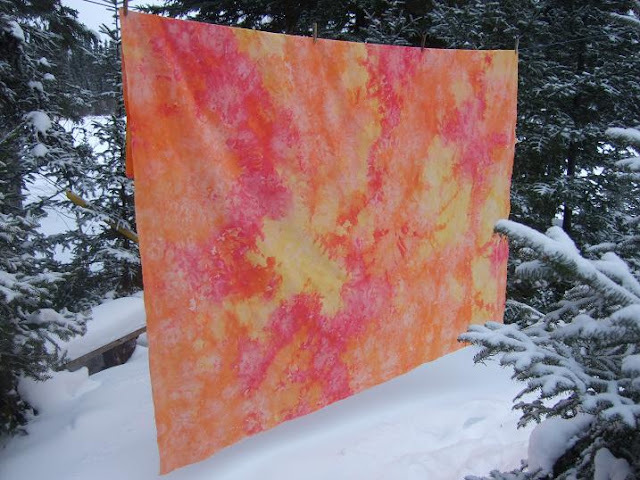 Once all the snow has melted I rinse the fabric with TNA soap and then soak the fabric in Raycafix for a few minutes to set the dye. Then a quick rinse and spin in the washing machine, a trip to the dryer and voila!! 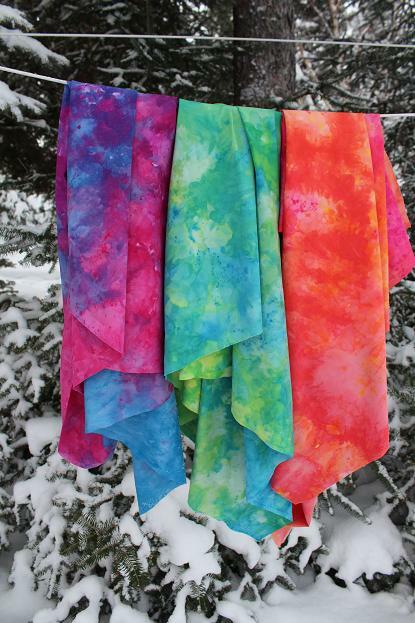 Here are a few links to some of my other snow dyeing posts. I have started snow dyeing quilt backing as well. Close up of the texture. Beautiful job Kathy! I love how your fabrics turned out. 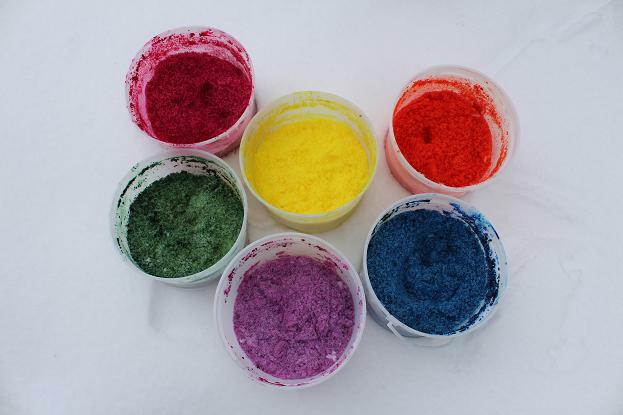 I've used a different process of snow-dyeing, without the screens. 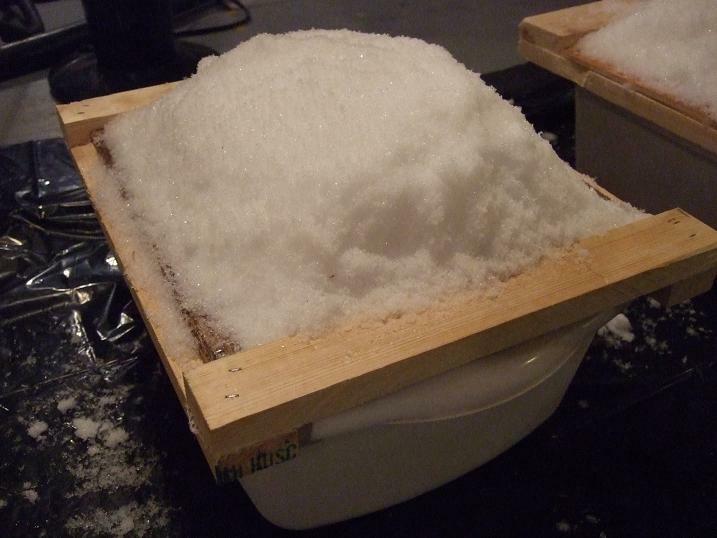 I just let all the snow melt with the fabric in a plastic container. Your textures are great. 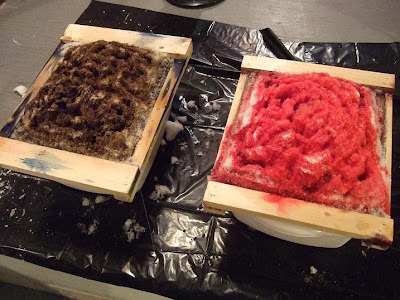 laureb - how do you dispose of the snow/dye slush left over? Is it harmful to the environment if I dump it outside? I dump the melted snow down my laundry sink in my crawl space. The water just contains a small amount of dye, I only use about 1 tsp of dye in my water mixture and most of that ends up in the fabric. The sodium carbonate used to pre soak the fabric is also used in swimming pools to increase the waters pH so what residual amounts that comes out of the fabric would not be harmful to the environment. 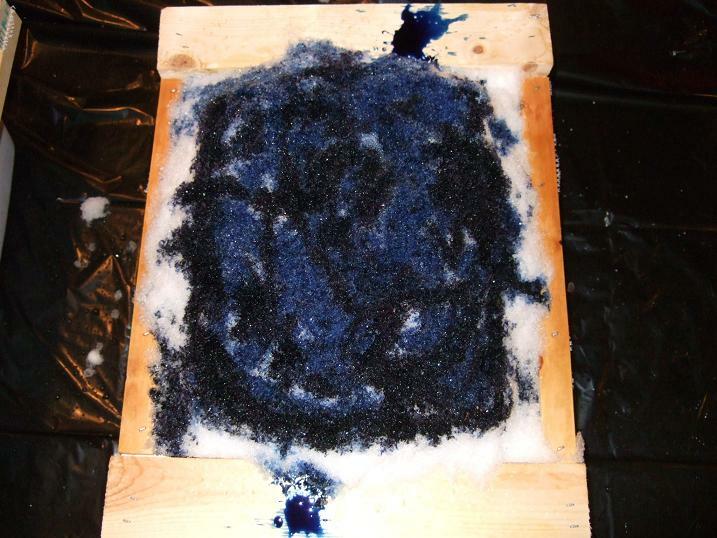 That said I don't think I would just dump it outside, you don't want animals licking at the dye. 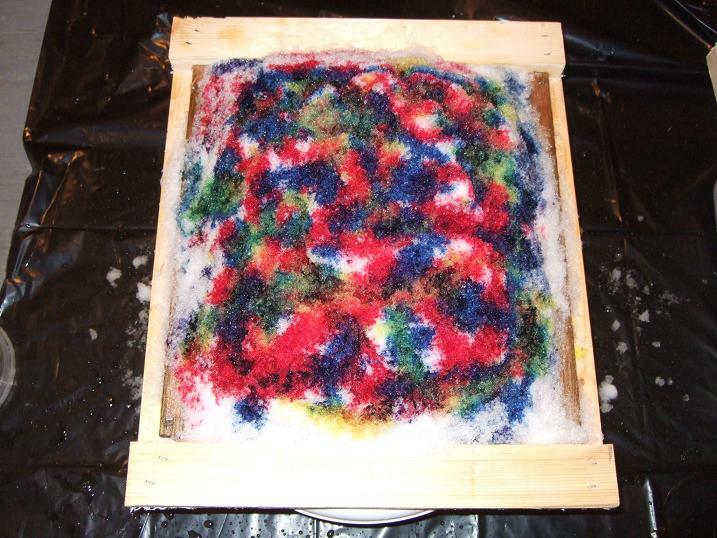 I put salt in my dye mixture and that might attract animals to where the water was dumped. MX Procion dyes, I'll change my post to add that info. Ann Marie, I live in Florida too but was told about snow dying by a friend from Denver. I did the process using crushed ice. 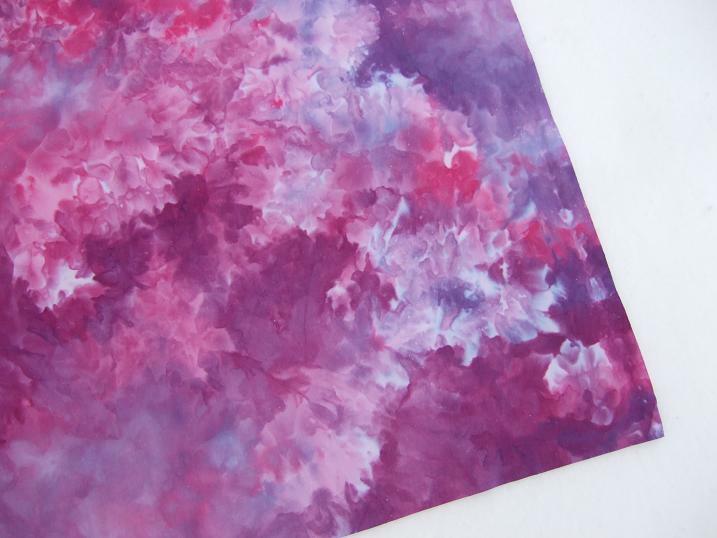 It was my first time to dye fabric and I loved it!! This is so fantastic, I would like to try this out. Living in Iceland I think I would have enough snow LOL LOL at least some of the time. What an amazing talent you have, Kathy. 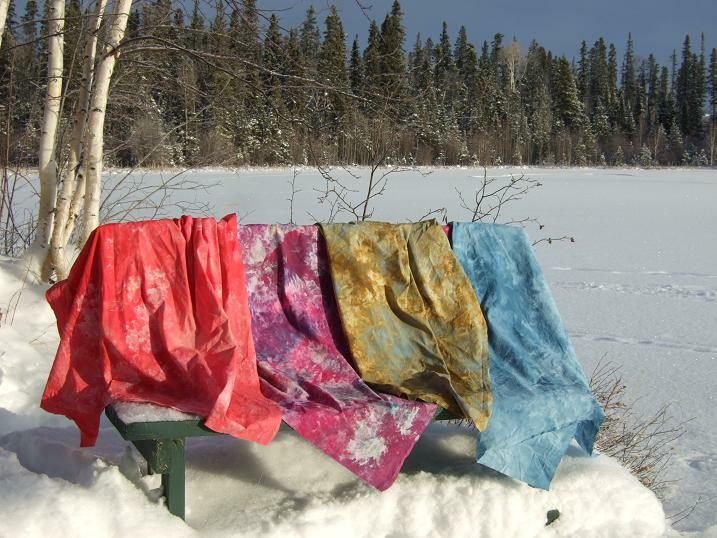 I love the results of the snow dyeing. I am in Nova Scotia and we do get our share of snow, but I am just too lazy to try something like that. Good for you!!! I wish you much success. 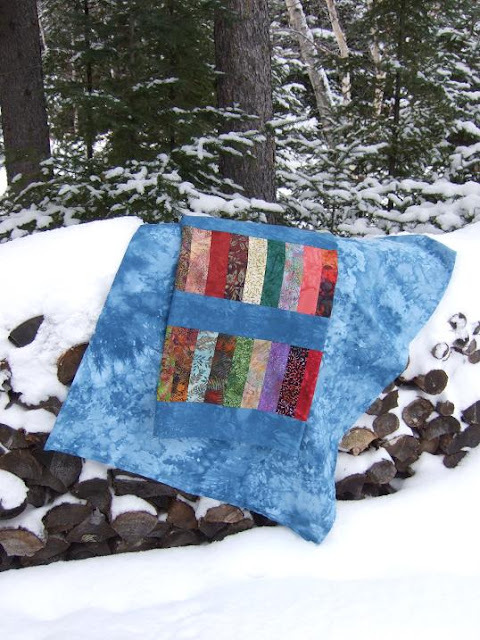 You have beautiful and unique quilts posted. I stumbled upon your blog on Pinterest while searching for fabric dyeing tidbits. I can see that I will have much to learn from you. I lived in Thompson for 10 years and The Pas for 3, so I feel like you're a bit of a kindred spirit. I look forward to following along. Yes you can. 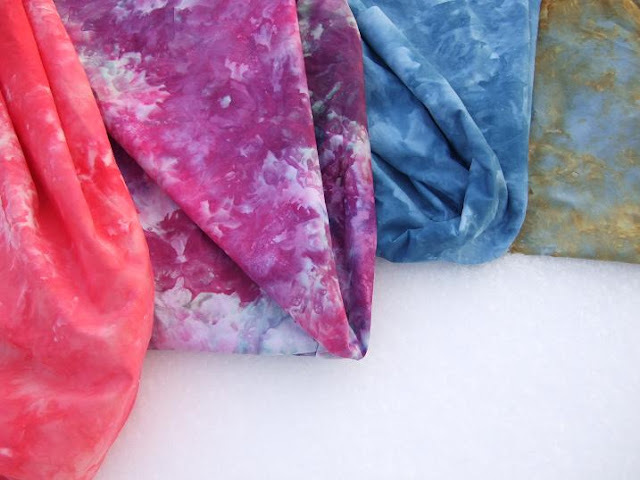 If you search my blog you'll see my ice dyeing experiments. Check out my post on July 14, 2016.